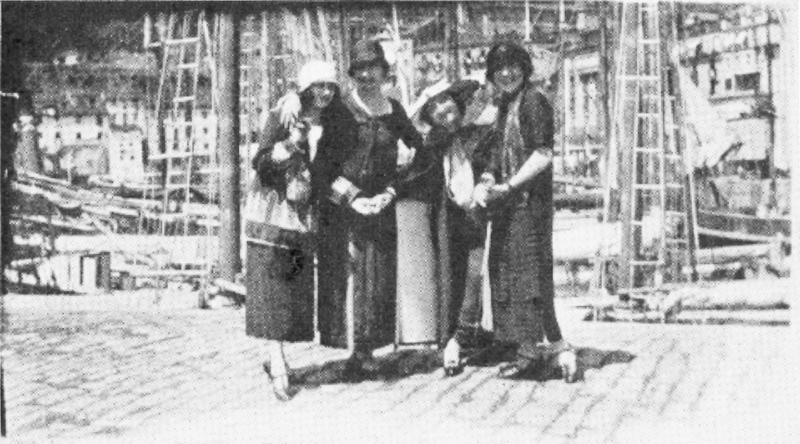 Both Emma Calvé and Ursula spoke of “motoring,” or automobile excursions, as activities they enjoyed—Madame Calvé in her autobiography and Ursula in the travelogue she wrote for her sorority’s quarterly journal. 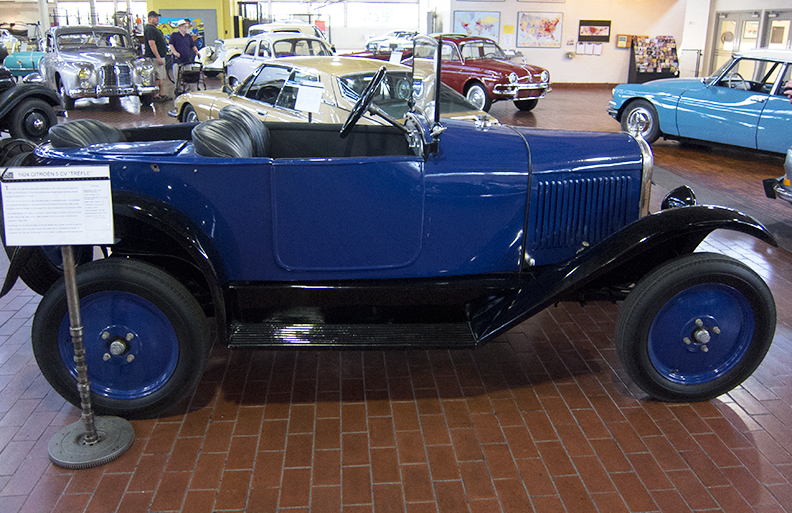 I imagined Madame Calvé, Ursula and the other girls motoring about when my husband and I recently visited the Lane Motor Museum in Nashville, TN. 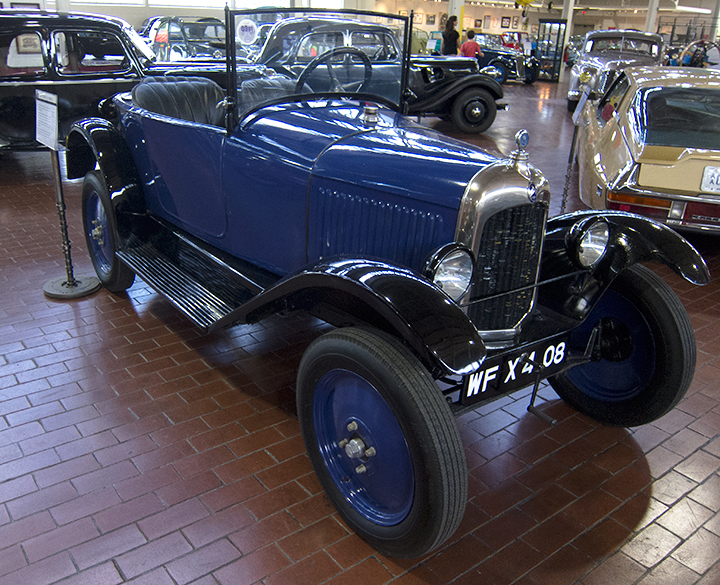 Among the many cars and other vehicles from different countries and periods on display was this 1924 Citroën 5CV Trèfle—from the very year Ursula visited France. 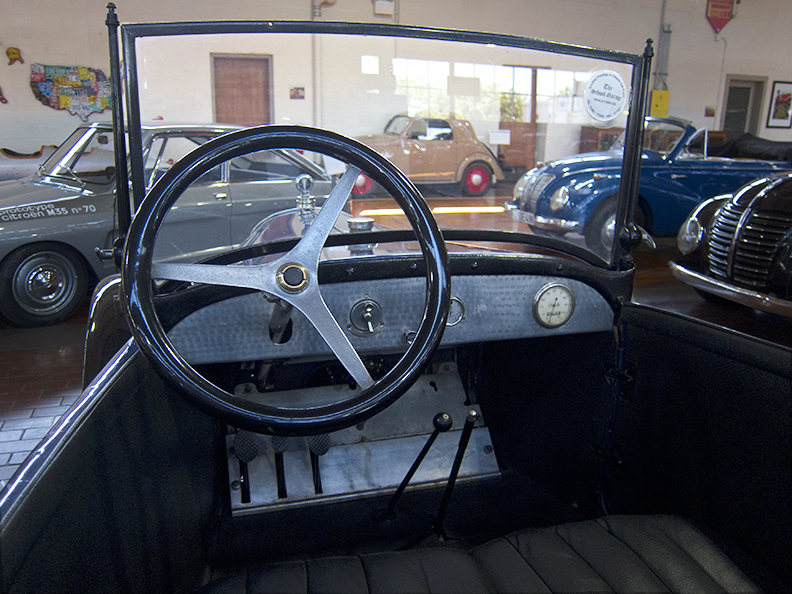 Produced in France, the 1924 Citroën 5CV Trèfle had a 3-speed transmission, front engine and rear-wheel drive. Did opera great Mme. Calvé own such a car? Did Ursula ride in one like this or see one on the roads? 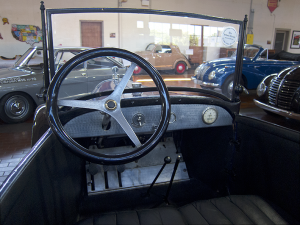 It’s impossible to know; it was just cool to see a car from her day and place and imagine her breezing along in it, hand on hat, and scarf whipping in the breeze. In part one of Ursula’s travelogue, we learned about Ursula’s voyage to the south of France to study with famous opera singer Emma Calvé. In part two, she told us tales of life at Madame Calvé’s castle, Château Cabrières. In part three, Ursula and the other young “song birds” have a glorious summer exploring Europe with Mme. Calvé. “July was spent in a villa by the sea, at Biarritz, a summer resort of the Bay of Biscay. The coast there was beautiful—rugged with small coves and beaches—and the promenades are shaded and hedged with the tamaris tree, so dear to France. Here we had our lessons as usual, but we also found time for a few swims in these lovely surroundings. Leaving Biarritz we went through Spain on our way back to the château. Spain seemed a land of romance, for the poorest little house had its balcony and flower garden. At Saint Sebastian we saw a bull fight. 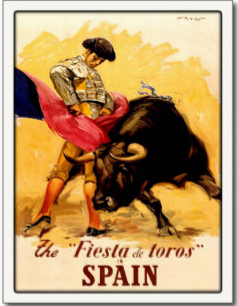 It was a glorious sight to see the arena filled with enthusiastic Spaniards and to see the Grand Entrance procession of the toreadors in their gorgeous costumes, but when it came to the actual fight, and the killing of the bull—it was terrible. We hid our faces behind our fans most of the time, but even with what we did see we left with a very unpleasant feeling. 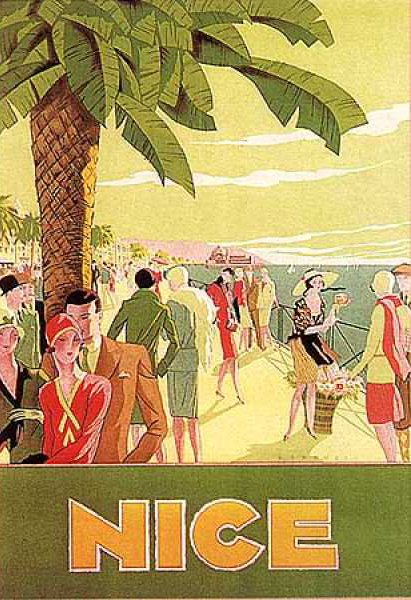 After another month or so of study at Cabrières we left for the French Riviera, a land of sunshine and flowers, bordering on the great Mediterranean sea. Nice, the center of the Riviera, is a beautiful city, visited in the winter by people from all over the world, and on its famous Promenade des Anglais at the water’s edge, one hears all languages spoken. Monte Carlo is another interesting place, well known for its Casino. Here I played once (ten francs worth) and lost. The Casino is open every day from nine in the morning until midnight and is visited daily by some persons who play the game as a profession. Leaving Nice, we motored over the Grande Corniche road and through the Maritime Alps which overlook the Mediterranean. From one high point we could look back over the French coast to Marseille or further, and also a great distance down the Italian coast. I shall never forget this picture. The shores were washed with water of azure blue, while the hills were studded with gaily colored villas. 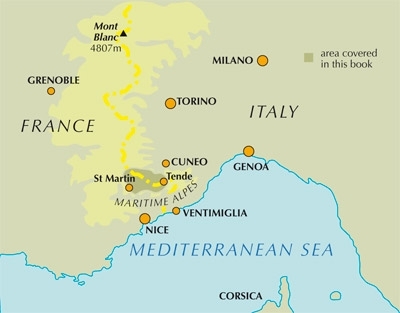 Also, from this same point we could look down on the French-Italian border, and soon we found ourselves at the line showing our passports, first to the French authorities to get out of France, and then to the Italian Riviera with its Santa Margherita and Portofino. As we moved on toward Rome, our destination, we passed through Genoa, the birthplace of our dauntless Columbus, and where it seemed to me the church bells rang all night long. 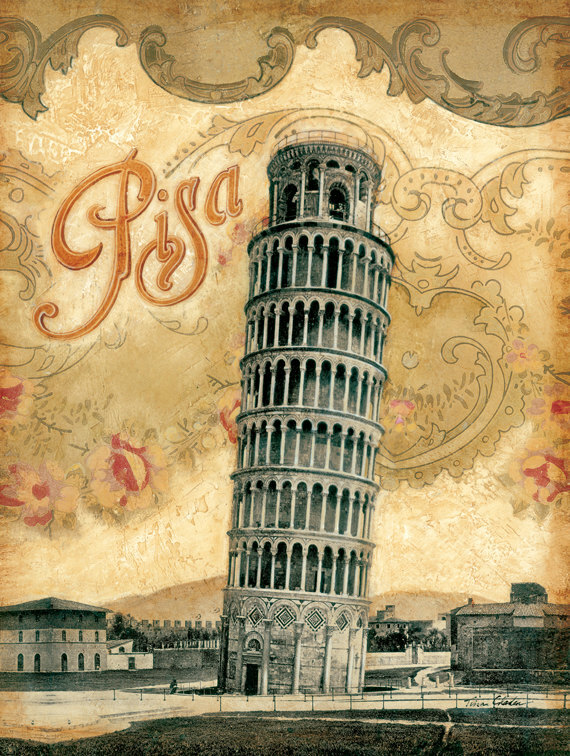 We also stopped at Pisa to see the Leaning Tower, Cathedrale, Baptistere, and Camp-Sano. Such a lovely group! The tower is so impressive and fills you with awe and wonder as you look up into the air at this huge stone structure toujours penché (always leaning). Now we are in Rome—‘The Eternal City’ with all its wonders—St. 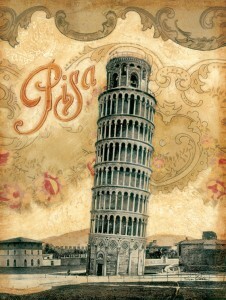 Peter’s, St. Paul’s, the Pantheon, the Colosseum, the Vatican and many other places too numberable to mention. And so I am beginning to realize what riches and splendor the old world holds for us! Up from the quiet river the lombardies climb to the sky. A magpie swings toward the sunset, and God seems very near.